Every golfer knows that the key to lowering your scores lies in course management. This involves knowing the front, back and centre of the green as well as the yardages to key locations on the course. Improving your golf game can be a very lengthy and complicated process. The evolution of technology has definitely made way for progress in this area. 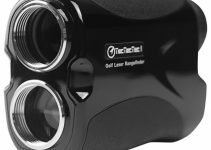 Having access to golf GPS trackers is something that golfers may sometimes take for granted, but these instruments can be invaluable in improving your golf skills. 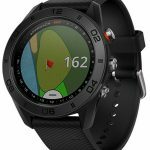 Course management has been made easier for golfers through the development of GPS technology and its integration in watches. However, choosing the ideal golf watch can be such a daunting task because there are seemingly a ton of choices. The key factors to consider before getting a specific GPS watch would be the cost and the user friendliness. The cost should be within your budget range and the watch should be easy to set up and operate. The watch basically needs to turn on, locate the course and display information while you are playing your round. 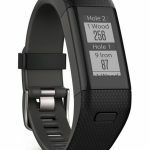 In order to get important information which will help you pick the ideal golf watch, you can check out our reviews of the best golf GPS watches on the market. Green view display – Displays the layout and shape of the green even when the user is behind it. TruSwing compatibility – When paired, the TruSwing golf swing sensor provides metrics to improve your swing consistency. Smart notifications – Notifies you for incoming calls, texts and other alerts. CourseView – Automatically updates frequently played courses for free. AutoShot – This round analyzer measures and auto-records shot distances. Activity tracking – Move bar alerts remind the user to keep active whether on or off the course. Displays distance, time of day, calories burned, and more. Battery life is great when compared to previous models. Has a comfortable wrist band. It can get cumbersome to press the buttons all the time. 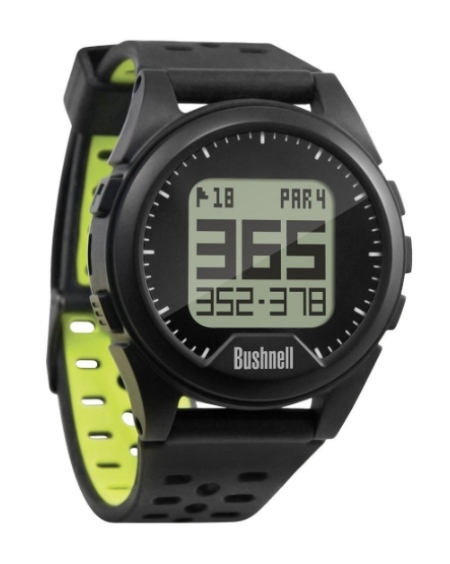 The Neo Ion GPS watch is manufactured by Bushnell to help golfers effectively manage the course. 35000+ course preload – The watch is preloaded with more than 35000 courses in over 30 countries. The cable used for recharging does not firmly secure itself. You can use a clip to secure the cable. Plays like Distance – Provides the golfer with target distances adjusted for uphill or downhill shots. Smart Notification – Allows you to receive texts, calls and email alerts from your phone. Big Numbers Mode – Makes it easy to view information on the screen. 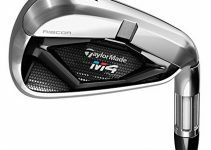 Club Advice – Records how far you hit each club and uses this to recommend you on the best club to use. This is based on the distances of your shots. Automatic Course Update – It automatically updates the courses at no additional charges when a Wi-Fi connection is available. Bright screen that is clearly seen even on a sunlit day. It has nice added features. The screen is on the smaller side. The IZZO Swami might be compact, and it might not be a watch, but it delivers accurate and fast measurements. It is extremely lightweight at 2.4 ounces, and it can be easily carried inside pockets or clipped to a golf bag. Compact design – The device is small and can fit inside a pocket. Large 1.8 inch display – Makes it easy to read the information on the screen. The display includes the hole number, hole par and time. It has large number readouts. It’s not very user friendly. It takes time to fully charge. 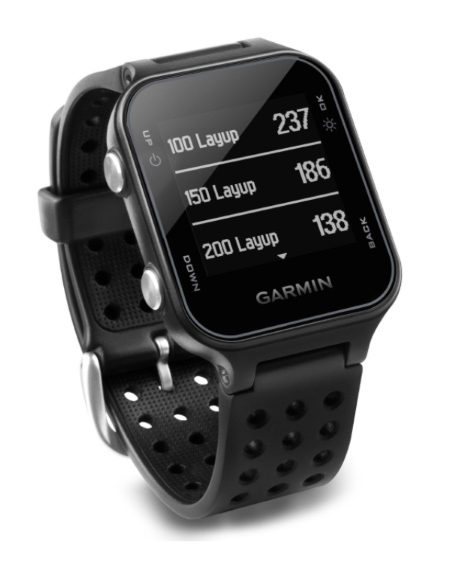 The Garmin Approach X40 incorporates golf tracking activity to a wrist-based monitor for measuring your heart rate. 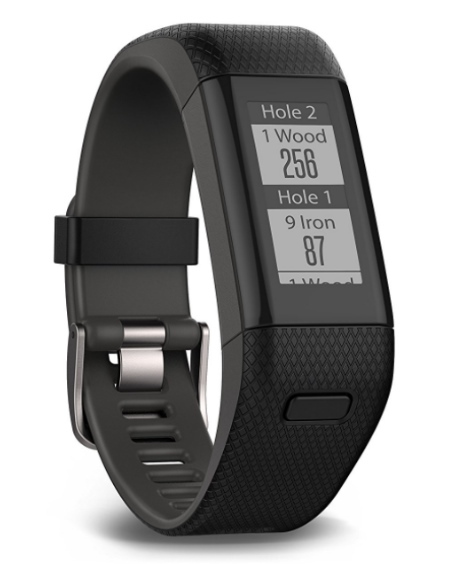 The watch enables you to check on your overall fitness as you play golf. 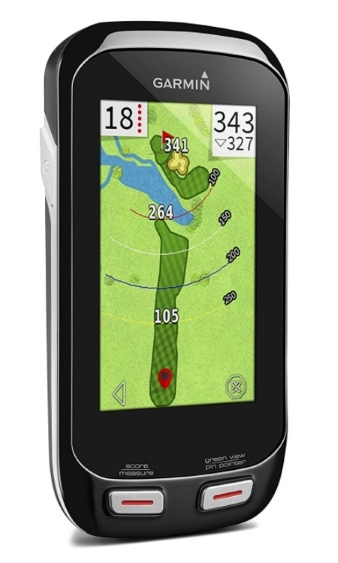 The X40 utilizes Garmin Connect, an online golf community which enables the user to play and then share and compare their rounds. This helps you to track your improvements through every course. You can also use the Garmin Connect app in any compatible Apple device to assemble your ideal rounds and combine your best scores after each hole. 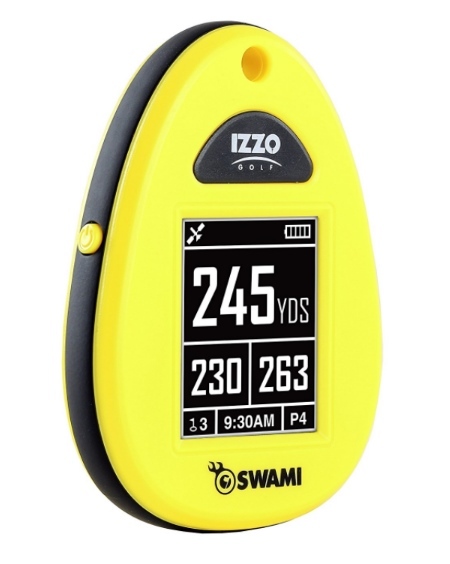 GPS receiver – This displays the distances to the back, center and front of the green as well as the presence of any hazards. Heart rate technology – The technology is inbuilt into the wrist band to help measure your heart rate 24/7. Autoshot tracking – The tracking feature allows the user to measure and automatically record the shot distances for future reference and comparisons. Activity tracking – The feature shows the amount of calories burnt, distance, steps and the intensity of the activity. Smart notifications – Vibrations to notify you in case of incoming calls or texts. Hole layout view – This displays the layout of the hole as well as the player’s current position. Notifications – Synchronizes with your smartphone to notify you in case of any incoming calls, texts, etc. It is very accurate in measuring distances. It has a comfortable fit. Some of the features are difficult to understand and use. The icons displayed on the hazard screen are too small to view. 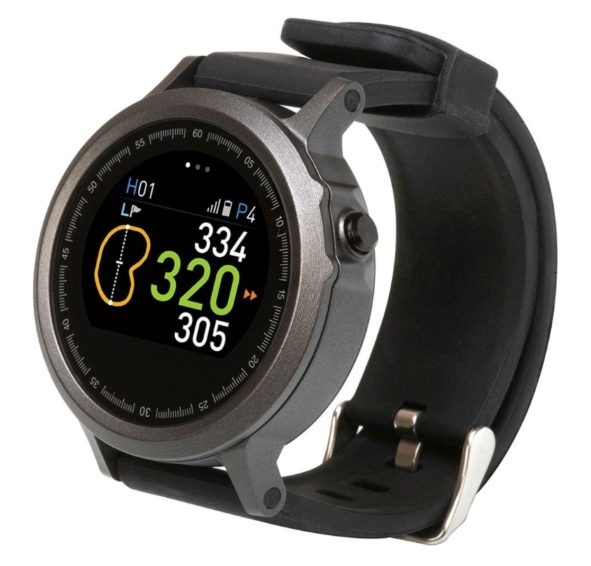 Having a sportier look and slightly less tech-savvy software, the GolfBuddy WT5 is a simpler version of a typical highly-sophisticated golf GPS watch. While it is of very high quality and generally satisfies its customers, its features are somewhat limited to basic GPS tracking. Nevertheless, it ranks high among major golf GPS competitors. Showing yardage from the tee to greens may be the most essential feature of a golf GPS watch. 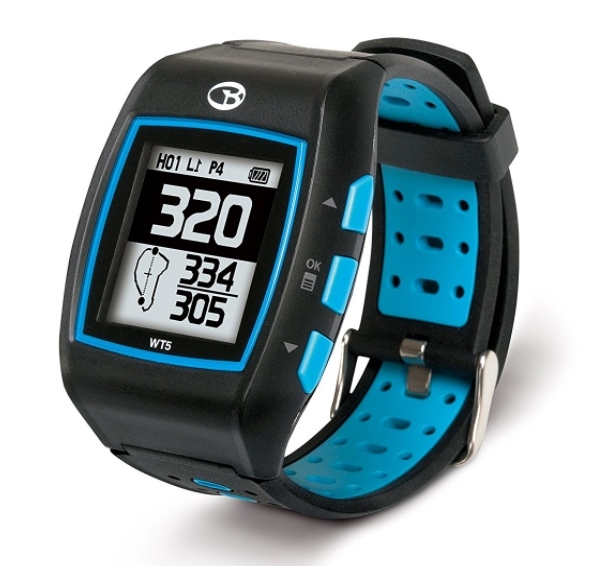 The GolfBuddy WT5 also shows the distance to hazards such as water and bunkers. To see the yardage from different locations, you can use the pin placement feature. Use the digital scorecard to conveniently keep track of your score. Golf course information is automatically uploaded. With 38,000 available courses around the world, you are more than likely to find all your local golf courses. It measures your shots so that you can get a better idea of where to improve. Having the ability to track other sports makes the watch highly versatile. Being water-resistant allows for more ease when wearing it in various settings/situations. It’s easier to use due to slightly more limited features and simpler technology. The yardage measurement may not be as exact as some might prefer. It does not show a map of the greens, which can be a big disadvantage for visual golfers. It contains fewer golf courses than other competing brands. Unlike other high-quality GPS trackers, it does not have shot analysis statistics post-game. It doesn’t offer very much golf-mode battery life – only enough for about a game and a half. Its design is not customizable, meaning the wristband cannot be easily changed. Thus, the watch may not be appropriate for some professional/social settings. Another very sporty-looking watch, the Garmin Approach S4 has more features than other quality GPS watches. 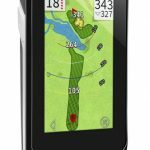 With a high-resolution touchscreen, some map features, 40,000 golf courses, statistical tracking information and text, e-mail and call notifications, it is no wonder why Garmin Approach S4 is among golf GPS user favorites. It is among the highest-rated golf GPS watches. 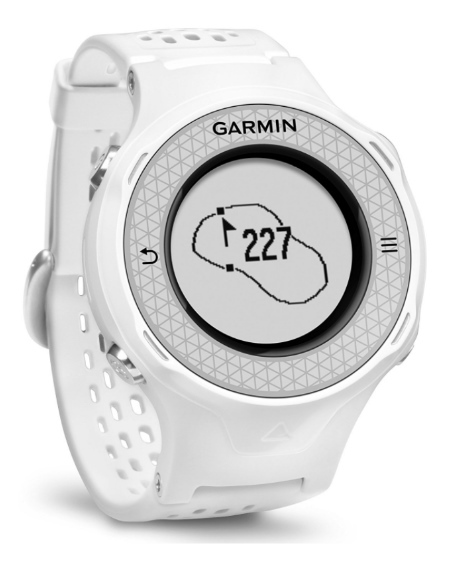 The Garmin Approach S4’s yardage measurement is slightly more precise than other competing watches. Its readability is of great quality due to being tailored for sunlight exposure and having high resolution. The watch conveniently shows the shape of greens for a more visual interface. You will find more golf courses on the Garmin Approach S4 than on the vast majority of golf watches. You can keep the score using the scorecard. It gathers your shot measurements and information to give you detailed statistics post-game. This is a great feature for significantly improving your skills. Never miss a call or important e-mail with its notification feature, which allows you to read texts and notifications directly from its screen. It has a longer battery life than many other watches. It can go under 10 meters of water without a problem. 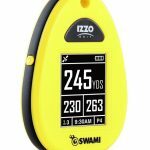 Its yardage measurement is not as exact as the newer Garmin Approach S60, and it does not include yardage to hazards. Unlike other Garmin Approach watches, the map is not in color. Aside from the odometer, it does not offer other sports-tracking features. It does not have a customizable design. 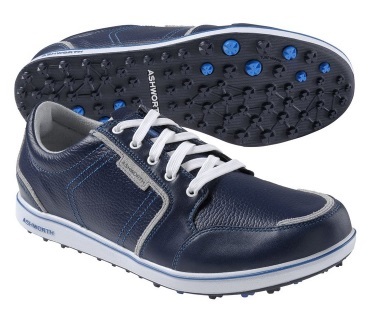 Similar to the GolfBuddy WT5, it may not be appropriate for other professional/social settings. It does not come with a manual, so you will have to look up usage instructions on their site, being that it is a slightly tech-savvier watch. The Garmin Approach S60 does not disappoint, being one of the fanciest and highest rated watches on the market. With this sophisticated and well-rounded piece, one is almost guaranteed to have an excellent golf experience. 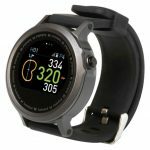 Though it may be too sophisticated for some new golf GPS users (due to its more complicated software), starting off with this watch may just put you ahead of the game. 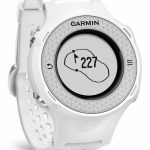 It has the most precise yardage within its brand, making the Garmin Approach S60 one of the most precise watches out there. Being able to keep your gloves on while using the GPS allows for greater comfort and less distraction from the game. You are more than likely to find just about any golf course with 40,000 uploaded courses from around the world. It quickly recognizes and uploads golf course information so that you can begin playing right away. Like the Garmin Approach S4, this watch gathers your shot measurements and information to give you detailed statistics post-game. It comes with other sports profiles, which makes for a more comprehensive physical activity monitoring system. Also includes the text, e-mail and call notification system. It can go under 50 meters of water without a problem – ideal for water sports. 10 hours of battery life is more than enough for two complete games. Its customizable design allows for multiple band combinations so that you can wear the Garmin Approach S60 anywhere you go. It does not have as much watch-mode battery life as other competing watches. This is a highly tech-savvy gadget, yet it does not come with a manual. 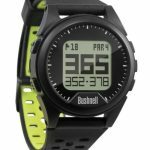 These are some of the best golf GPS watches out there, with more features than generally necessary. Countless golfers have trusted these devices to take their skill to the next level. With features such as precise yardage measurements, visual aids, post-game analytics, and thousands of preloaded courses from around the globe, these devices are revolutionizing the world of golf, giving hope to golf enthusiasts everywhere who seek to polish their game. 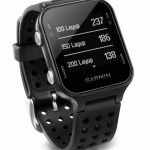 Of the 9 best golf GPS watches reviews above, we’d have to say that the Garmin Approach S20 tops the list. This is due to the great number of advantages it has. It is very affordable, and the average customer rating is incredibly high. 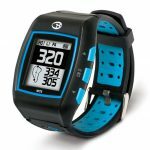 For most golfers, the ideal GPS combines both user friendliness and cost friendliness and no watch on the list does this better than the S20. You should get a watch that offers value for the money, time and the effort that you intend to spend. Thanks for reading this guide. If you have any questions, feedback or comments, don’t hesitate to drop them in the comments below. Be sure to share using the share buttons. Thanks for the comment Brett. Indeed, the Approach S2 is a good one. It’s preloaded with 40000+ courses, it has yardage to the front, back and middle of the green, it has dogleg and layup distances, and it has a scorecard. It has an average customer rating of 4.3/5 with over 900+ reviews on Amazon, which is pretty darn amazing. The S2 is a really good option. Let me know what you go with! I recently picked up the Garmin Approach S20 – I live down south so I was able to play a round last week at a course that was built in to the preload. It was terrific. It did exactly what I needed it to do and it was easy to use. Distance accuracy is excellent, there’s plenty of info to help you including hazards and layups, and I didn’t have any problems using the Garmin app. In terms of value per dollar, the S20 is absolutely the way to go… and just looks at the reviews it has. Your picks are great, although I would add the S2 to the list even though the S20 is essentially an upgrade to it. Thanks for sharing. This is exactly why I have the S20 at the top – it’s arguably the best watch for the price. Very popular. As for the S2, I’ll look into adding it to the page. Thanks for the suggestion! 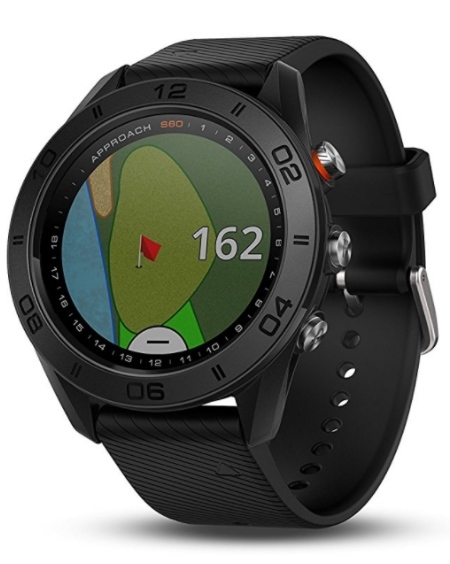 I have the Garmin Approach G8 Golf Course GPS because all of the golf watches seem too large and bulky for female wrists. I do like the screen on this anyway and its preload seem to have everywhere I’ve golfed in Florida. Do you know of any less bulky watches that are good in case I decide to make the switch? As for the Garmin Approach your review is spot on, except that you said it has “smaller screen” well this smaller screen is larger than those on the watches. I like that I don’t have to put on my glasses to see it. Unfortunately, there aren’t many options out there in terms of GPS watches that are tailored to women. The one that I know of, the Golf Buddy Ladies LD2, has received a lot of complaints about defective units and other functional issues, so I would be hesitant to recommend it. If you want to switch to a watch, I suggest you get one of the high rated models and adjust the strap for your wrist. Otherwise, a good handheld unit like the G8 would work great. Good luck. Nice guide. I’m in the market for a watch after having a hand held older model of a GPS that finally quit working. It was very not user friendly. We had one or two nice golf days up in upstate New York then it snowed again. I’m looking to get an easier to handle model and was looking for a watch this time to make it easier and I found your page. The problem I have with the Garmin s20 is that it has so many technical things it wants to track. I’m not sure I want to jump into that much after being used to scoring manually and doing my own thing. From what I heard, there are a lot of procedures and button pushing on this device that you have to do. Can you shed any light on that? I wouldn’t worry about that Dan. It’s true that you need to press a lot of buttons to navigate the S20, but I think that once you get through the learning curve and get used to using it, it’s fine. Overall, it’s a fantastic GPS watch. As for the technical data, I guess it’s a decision you’d have to make. Would it be worth it for you? You can always ignore the data you don’t really care for. I hope this helps. I travel internationally. I see that they have about 30,000 courses. Before I pick up one of these watches or GPS, I was wondering if they cover courses that are in Europe and at what percentage rate? If I’m playing in the UK, I’d like to know I’m getting my money’s worth. Hi Charles. These watches most certainly have courses from Europe preloaded (pretty much all of them have a global preload). As for whether or not the watch has any of your local courses in your particular country loaded, it’s hard to say. I would recommend contacting the manufacturer and asking them about this. I had the Bushnell watch and I got one of the bum ones that wouldn’t charge properly no matter what I did. That’s mostly what the negative reviews on the watch are for. A certain segment of them seem to just not clip in and another segment of them will clip but not make the connection to charge. Until they fix this they should test the ones going out the door, and not send anymore out. It should fall down on the rankings just for the frustration of having it not be usable. I loved the design and the price, but if I can’t get it to charge to reuse it, what’s the point? I think I’ll be trying another brand. Sorry to hear that you’re having problems. Unfortunately, defects show up from time to time, and in that case you should just contact the manufacturer’s customer support (or the retailer where you bought it) and they’ll get you sorted out, either with a refund or an exchange.